We have a bold vision that challenges us to break down barriers and build a faith community where every person can bring and become their authentic selves. We are growing into this vision step-by-step, learning and growing together, and moving forward to create our model of the Beloved Community. Gwinnett County needs our commitment to building and growing connections and community across all borders beyond the walls of our sacred space. Your generous contributions make it possible for us to grow into this bold vision. We value every financial gift. Please consider what this community means to you and the difference it makes in your life and in the wider community. 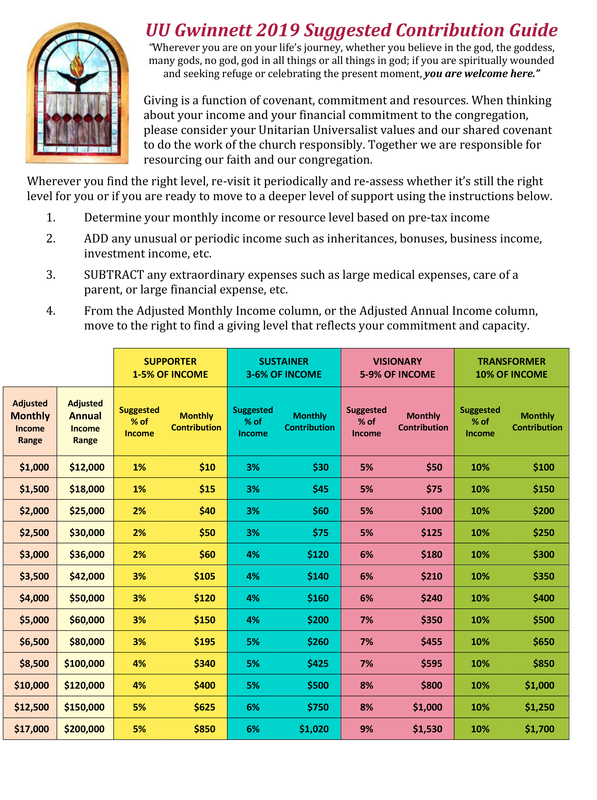 Using the Giving Guide below, please pledge as your heart guides you and your finances allow. "No goal is so purely spiritual that it requires no money, space or time and no action is so financial as to lack ethical or spiritual implications." - Dan Hotchkiss in Governance and Ministry." All our contributions make it possible for us to live into our vision of a radically welcoming congregation in a green space, and nurture connections within our walls and beyond. We greatly value your heartfelt pledge in any amount....every pledge absolutely makes a difference! Together we can make such sweet harmonies as we create a model of Beloved Community. I / We consistently provide financial support for UU Gwinnett each year - please renew our annual commitment until I/we send notification otherwise. If your circumstances change during the year and you'd like to increase or decrease your giving level, please contact the Treasurer at Treasurer@uucg.org. UUCG’s fiscal year is January 1st to December 31st. If you need to request a financial waiver for 2019 please contact President@uucg.org or RevTaddeo@uucg.org.